Martin, Chris, and Phil recording the podcast. Martin, Chris, and Phil recording the podcast. Kranti! 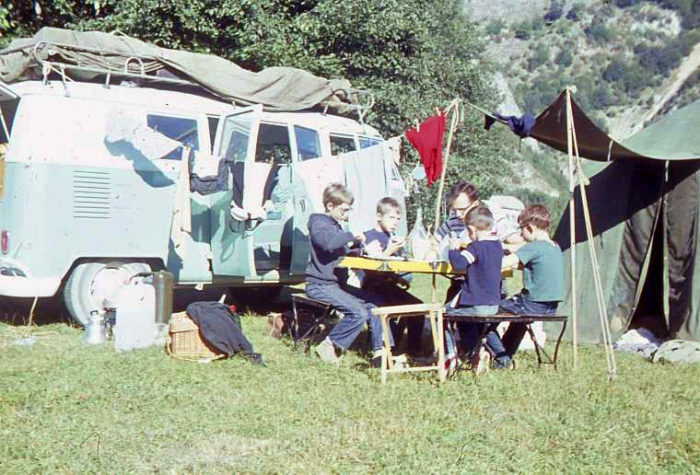 — almost starring Martin Holladay A photo of Martin Holladay (second from left) at the age of 8, camping in Yugoslavia with his family. The photo was taken in 1963. You know him, you love him (or at least his articles): Martin Holladay. 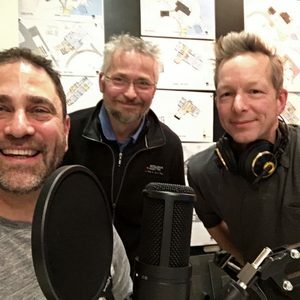 He was in the neighborhood, so he stopped by to chat with Phil and me for this episode of the Green Architects’ Lounge. This is your chance to get to know the man behind some of your favorite blog posts and Fine Homebuilding articles. Background: Hear how he spent his youth abroad and how it has shaped his current views on green building. Green lifestyle: We have a good discussion about Martin’s off-grid lifestyle. State of green construction: How are we doing as a nation? Are we meeting the challenge before us? What would he build? Phil and I try to pin Martin down (not an easy thing to do) on how he would build a new house for himself. Of course, we do this by posing a silly hypothetical question. Part two of the question: would he use an architect? What’s on the horizon for green building? We have a nice discussion on what the future may hold for the green movement. 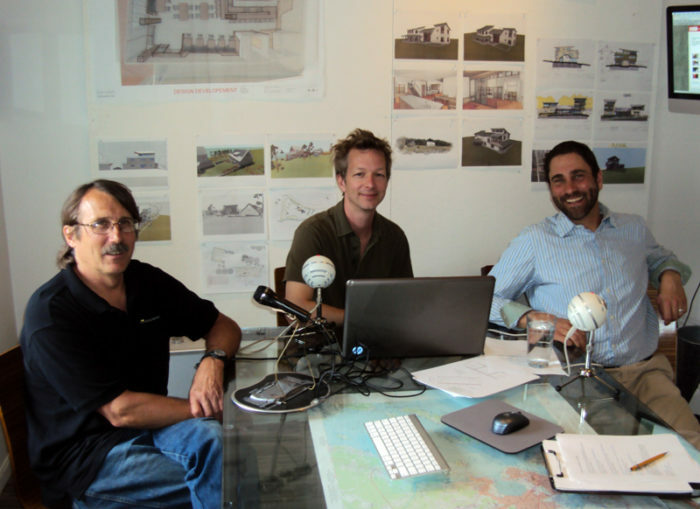 Subscribe to Green Architects’ Lounge on iTunes— you’ll never miss a show, and it’s free! Don’t forget to tune in later for Part 2, in which we chat about “Sprout Follies,” the common misconceptions held by those new to green construction. We also make it out to a bar, where we share a beverage and Phil shares his song of the episode. Thanks for tuning in, everyone. Cheers. Phil Kaplan: And I’m your host, Phil Kaplan. Phil: Speaking of cold climates, we’re pleased to have someone here who’s from a colder climate than us — Martin Holladay. Martin Holladay: Hi. I just drove over from Vermont to see the Atlantic Ocean. Chris: How was your drive? Martin: Well, I came through Crawford Notch, which is always a pleasure, and then through North Conway and Conway, which were less encouraging. Chris: Martin is the senior editor at Green Building Advisor and a contributing editor for Fine Homebuilding. Phil: Everyone’s favorite blog is Musings of an Energy Nerd. If you go on to GBA, you’ll see it’s always the one with the most comments and contentious conversation and exciting stuff. Chris and I are excited to have the opportunity to grill him. Martin: I’m a journalist finding myself on the other side of the microphone. Chris: We come at this from totally different angles. Phil and I both went to architecture school before entering the real world, so we got our academic experience first. And you probably came to it from the exact opposite — am I right? Martin: I was a builder and a remodeler. A hippie builder. I had an old pickup truck. I used to have even more humble vehicles before I could afford a pickup truck. Chris: Did you ever have a VW minibus? Martin: No, although my parents did. Phil: Not a horse and a carriage. Martin: No, but I started back in the days before nail guns, back in the 1970s. I was always off-grid, so even when I bought nice power tools, I couldn’t use them at home. Chris: Where did you grow up? Martin: I grew up in Beirut, Lebanon, where my father taught theology in a Protestant seminary. An American family, but we grew up overseas. Chris: Fantastic. So, you got around. Martin: I had the fortune to be able to travel internationally as well as to work and volunteer overseas. Phil: Give us a little rundown. Where have you been? Phil: Bollywood! You didn’t dance in any of those movies, did you? Chris: So, listeners — our Indian listeners: If you have any kind of footage of the young Martin Holladay — what was the name of the movie? Martin: The big movie was Kranti. 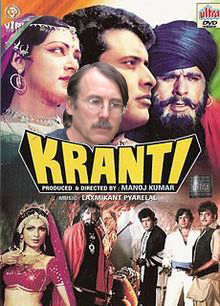 Kranti was a big-budget Indian movie. I finally got the video years later and watched it. I ended up on the cutting room floor. They filmed me in a British army officer’s uniform, a heavy wool uniform in the sweaty Indian sun, and I had to run across the field. I actually died on the battlefield — but I never made the final cut. Chris: I was really looking forward to seeing that. Did you have the same mustache back then? Chris: So what brought you back to the States? Martin: Well, ever since I dropped out of college in 1974, I’ve lived in the same piece of woods in the Northeast Kingdom of Vermont, in the middle of nowhere. I’ve had a stable address, in spite my travels. I went to college, and like a lot of back-to-the-land hippies in the mid-70s, we all decided that an academic degree was not as important as the real world, and we wanted to do things with our hands. I read the Whole Earth Catalog from cover to cover, and I was inspired by Stewart Brand’s view of a transformed world, and went out to the woods to do it. Chris: And look at you now. It paid off! Martin: Eventually, a phone line came up the hill, and then they invented the Internet, and I was able to work from home and connect myself more with the outside world. I was no longer so isolated with 4-foot snowdrifts in the middle of nowhere. Phil: So, how has your global perspective affected what you’re covering now? Martin: I suppose I’m aware of how those of us in North America are an unusual slice of the socioeconomic spectrum on the planet. Everyone talks about how 20 percent of the world’s population consumes 80 percent of the world’s resources, and that’s certainly true — and that’s us. We are the ones who are consuming everything. Our energy usage and our material usage are way off the charts in terms of our fair share of the planet’s resources. Chris: So, you probably feel that way more than my wife. I’m picking on her because she never listens to this podcast. Phil: You know, Sheila has her cell-phone number. Martin: It’s one thing to realize it academically, but if you travel a lot in the rural areas in Asia, then you realize that many places — places I visited — are off the grid; they’ve never seen electricity and never will. Most of the world is off the grid. Most of Africa and much of Asia did not have telephones until recently, until cell phones made that leap. People do not have running water; they bring their water in a bucket from somewhere far away. So, when people talk about “green” in America, it’s really hard to say that any of our choices are sustainable — because they’re not. To really have a revolution in which we equitably distribute the world’s resources would change our lifestyle fundamentally. Chris: So, basically, we have to change our ways faster than they change theirs to be more like us… Wait, help me out with this, Phil. Martin: I am not a wand-waver or a solution-finder. If you were to ask me my predictions, my prediction is that the climate will warm very quickly for my children’s lifetimes. The next generation will face a dramatic change in climate and there’s almost nothing we can do to stop it. If we had true political leadership we could stop it or come very close to an adequate response, but none of the leaders are doing it, and therefore it’s a pretty grim future. But I don’t think that we’re to blame, in the sense that…. Look, I’m still driving an 8-cylinder truck. I try to drive as little as possible, and my next vehicle is not going to be an 8-cylinder truck. But I don’t say I have a green lifestyle, because I don’t. I don’t pretend I know what the answer is, because I don’t, and I know I’m part of the problem. It’s very complicated for those of us in the high-consuming West — and I’m one of them. Chris: I’ve seen that bumper sticker, “What would Jesus drive?” — you usually see it on a Prius. But he was a carpenter, so he’d be in a truck. Phil: Martin, you say you don’t have a green lifestyle, but you live off the grid. You consume very little resources. If we all had the same not-so-green lifestyle as you, our planet would be in better shape. Martin: I don’t think so. I’ve often said that people living off the grid don’t have the most efficient use of energy. I depend on a gas-powered generator in the cloudy months of winter. I burn quite a bit of firewood — certainly a lot of BTUs. It’s good that it’s firewood as opposed to oil, but it’s not like I have a low-energy lifestyle. I consume a lot of energy. I think the lowest energy consumption is by people who live without a car in a downtown somewhere where they can walk to do their errands or bicycle. They live in a multifamily apartment building with shared walls. Living in a remote area, my transportation budget is high. I still fly in an airplane every now and then. So these are big problems, and I haven’t come up with good ways to crank down my carbon budget to where it should be. Chris: Here we are on the path to sustainability, whether we want to be or not. Because Mother Nature’s going to smack us to make us be more green. Where do you think we are? Phil: Are we seeing exponential change now? For some of us in the industry, it seems like “Boy! Things are finally getting going!” Is that a delusion? Are we really losing steam? Martin: I think we’re really talking about global climate change. That’s the fundamental challenge of our age, and the fundamental thing that green construction should be trying to respond to. Some of the best writers on the issue are Bill McKibben and Elizabeth Kolbert of the New Yorker. We are nowhere near coming up with a response that is proportional to the challenge we face. We’re falling flat on our face; we’re not doing it. 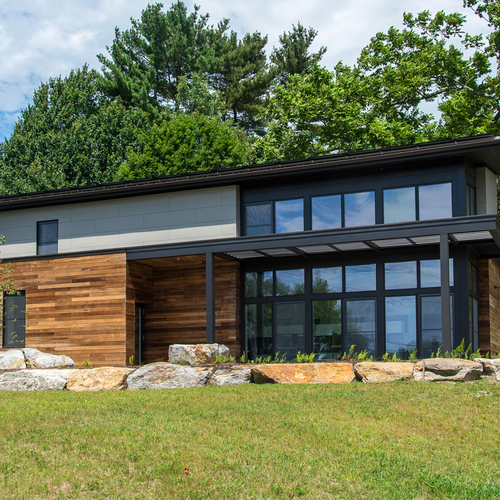 The greenest house that I’ve ever built and that you’ve ever designed is nowhere near an adequate response to what we’re facing — and that’s just a fact. If you look at our country as a whole — what is our transportation budget? What are our transportation solutions? What is the average residential new building going up consuming? What are our building codes? How about our commercial buildings and schools? They’re woefully badly designed and badly built. Chris: And it would take time to reverse that or change. Martin: And 50 percent of our electricity still comes from coal. Chris: Doom and gloom. The good news, though, is that guys like you and maybe me and Phil — we’re in the nose-diving plane, but we’re at least yanking up on the stick at least, we’re trying to level it off or survive the crash. Phil: I’m going to change gears a little bit. Martin, we have some bad news for you. Since you’ve driven down to visit us in Maine, your house has been destroyed in Vermont. I’m really sorry to tell you this. (Gasp.) We had nothing to do with it, as far as you know, but the good news is we’ve gotten a large insurance check for you — $500,000. It’s a lot. I don’t know if it’s too much; you tell us. So, putting you on the spot, what are you going to do with $500,000? What is Martin Holladay’s next house going to look like? Chris: We’re giving you carte blanche. Knowing what you know now — now you are a wiser Martin Holladay than you were way back — what do you say? Martin: Well, I guess I would follow the advice I usually give. You want to build as small as possible. You want to have a really good envelope and a really low energy budget for your house. Then I’d take the $300,000 I didn’t spend and use that to retire early or work a little less. Phil: We were guessing how much you extra there would be — how much you wouldn’t spend. Between $200,000 and $300,000 that you wouldn’t use. Chris: We decided, “Let’s give him $500,000” — make him say that he would give it back or give some to charity or or retire. Phil: He wanted to retire. He didn’t give it to charity. Martin: Oh, it was a trick question! Phil: So, you’d only spend only $200,000? I’m not going to let you get off that easy. Chris: Yeah, but you’re Mr. Technical. You have a comment for just about everything. Anything someone posts on that blog, you’ve got backup and you know what you want to do. You’ve got to have something percolating. Do you have something preconceived — “Here’s my approach?” Here’s Part 2 of the question: Would you hire an architect? For most people, a new house is a shopping exercise. For 3 percent of the public, they say they want to build or design their own house because they’re sick of living in a big vinyl box or someone else’s old house; and then a certain percentage of those actually hire an architect. Martin: I think you probably know that most American homes are not designed by architects. Architects are involved in a very small minority of residential projects. If I were building a house, I probably would not use an architect — but I’ve thought about houses a lot. I think the average American with a $500,000 check on the kitchen table would probably hire an architect, because they’ve got $500,000. Chris: And they probably don’t know as much as you. Martin: Did you guys get a good building science education in your architecture school? Chris: No. I think relative to other architecture schools it was good. But, well, we’re of the generation — I graduated in 1994. Phil, when did you graduate? Phil: I graduated in 1991. Chris: My class was the first class in that school that was really starting to get into — well, it felt that way — the green side of things. But it was more like how stuff goes together. Phil: Means and methods. We talked some about chemical systems and building systems, but not that much really. Martin: The danger is that somebody could go and hand a big chunk of that $500,000 check to an architect, and end up choosing an architect who doesn’t necessarily know how to design a wall or how — correct me if I’m wrong. Martin: And the same is true of builders. You could get a builder who builds a brand-new house and doesn’t know how to build a wall. Chris: He may have a whole subdivision. Martin: The certificate on the wall doesn’t really tell you much. What you want to do is interview the professionals you’ll be working with and hope they have some answers to your questions, if you’re an educated homeowner. Chris: But a guy like you — back to the original question — when we were thinking of asking you that question, we were thinking you would say, “I’d use an X heating system. I’d probably look at a Larsen truss or double-stud wall or SIPs,” or something like that. Phil: Are there specifics? There have got to be. Martin: Whatever specifics that I come up with are only specific to my climate. Martin: There is a kind of consensus among people building superinsulated, well-built houses in northern New England. We’re tending to see, if they really care about this stuff, that they’re getting R-20 basement walls, R-40 above-grade walls, R-60 roofs, and triple-glazed windows. And many of them are getting an air-source heat pump from Asia, one of the new minisplits, for heating. That’s not the only way to build a house, but more and more people are going in that direction. Phil: But that’s your house. Martin: No. My house is a hippie house put together with sawmill lumber and logs I cut down on my land and fieldstone that I gathered in a wheelbarrow. Chris: Would you do that again? Martin: No, I wouldn’t. If I had that check and I hadn’t been shamed into admitting that I had forgotten about my charity obligations and my spiritual life — I’d have to rethink the answer — after I tithed, and then double-tithed — if I were hiring out the work, and I could afford something different — I’d like to see a better envelope than I have on my 1980 hippie house. Chris: We’re wrapping up this part, Part 1. In Part 2, we’re going to talk about what Phil and I call “sprout follies” — the follies of those who are newly green, those who are new to this, those who are just getting into all this stuff. Sprouts. It’s an optimistic phrase, it’s condescending but it’s optimistic. Soon they will be green, just like the rest of us. Phil, do you have any last questions? Phil: What’s the next big thing in green — the world of green construction? What do you see coming around the corner? Is it the Living Building Challenge? Or toxicity? Or is Passivhaus really going to take off in this country? Or, what else is there? Passive survivability? What are the next big words? Martin: It’s hard to predict. The basic superinsulated approach was nailed down in the mid-1980s, but it still hasn’t been integrated into normal residential construction practice in America. So, I keep telling people, when we’ve learned all of the lessons of 1985 and implemented them, then we can look for something new. I think what we really need to do is educate builders and designers about basic air-sealing techniques — getting the basics down, which we’re still not doing. I don’t see any whiz-bang technological inventions ahead, and I’m very bad at predicting trends. I think the only thing that will change people’s attitudes is a doubling or tripling of energy costs, which is quite possible — although I’ve said that for years and have been wrong most of the time. But if and when energy prices take another huge leap, that will change residential construction in America very quickly. But, that’s about all I’ve got for predictions. Chris: Final question — how much better is Maine than Vermont? Martin: Well, you’ve got the ocean. But you’ve also got more traffic and more tourists. So, is it worth it to look out over the ocean and have to wait for the traffic at the traffic light? Chris: Damn right it is. Phil: That’s going to wrap it up for Part 1. Stay tuned for Part 2 with Martin. I enjoyed hearing the conversation with Martin although it broke through the mystique those of us have held of him who had known him only through his writing (its like being surprised by the first sight of the face of a radio personality you had long had a different image of). The $500k question was well conceived. From my experience in architecture school I agree building science and related issues are not given enough priority. At the university I attended building science content is a requirement in the curriculum but, despite this, the students are primarily focused on the design process (which is not entirely without defense). I do think every year more and more attention and integration is given to building science issues and energy modeling because the increasing consensus that environmental impacts of built works are a priority. I think there could be more recognition of what someone with a design background brings to the table. Here I think an analogy to good writing is useful. Everybody can write but the works of good writers stand out and often the reasons for this are not recognized by people outside the discipline. In good writing, like good design, the author has the ability to form relationships that leverage tools up a level in abstraction - structure, appropriate length of text blocks, grammatical clarity, etc. On the GBA Q&A building plans and elevations have been uploaded. Often these show a lack of good design which is apparent to those with a design discipline. In architecture, proportionality, rhythm, flow, integration of elements, etc., not only improve the qualitative experience of interior and exterior spaces but assist in construction and appropriate use of materials and have quantitative benefits when trying to reduce the environmental impact. In addition I would argue the ability to design - to bring disparate elements into coherent and synergistic relationships - can achieve the best solutions for combining thermal assemblies with fenestration with distribution systems (heating, ventilation, and cooling for those who can't live without it). Architects do have a bad reputation when it comes to building sciences not because of anything inherent in the discipline but because for the last couple of decades nobody cared and it was entirely disregarded. This is a generational characteristic that is now changing. True, the value that architects and professional writers bring to their works is not indispensable, particularly in rural residential design ; ) True, not all architects are good designers. True, some talented people not schooled in design can be excellent designers. Literacy in the building sciences is important but in sometimes I come across examples where it becomes the primary focus and subsequently the baby is thrown with the bathwater; the 'process of design' as taught in the discipline of architecture has a real value. Thanks for your comments, J. I often say "No Beauty, no green". I believe that people simply don't want to live in a house that's an unpleasant space to occupy, regardless of how little energy it uses. And I certainly think ugly houses are inherently unsustainable. I do think that we often see fewer architects than builders chiming into this forum, because design is so subjective and doesn't elicit the collaborative problem-solving energy that building science does. I wish that would change. In fact, I do agree that people who have emerged from design programs in the last 5-8 years or so have gotten a radically different education than those of us did who graduated in the '80's and 90's. 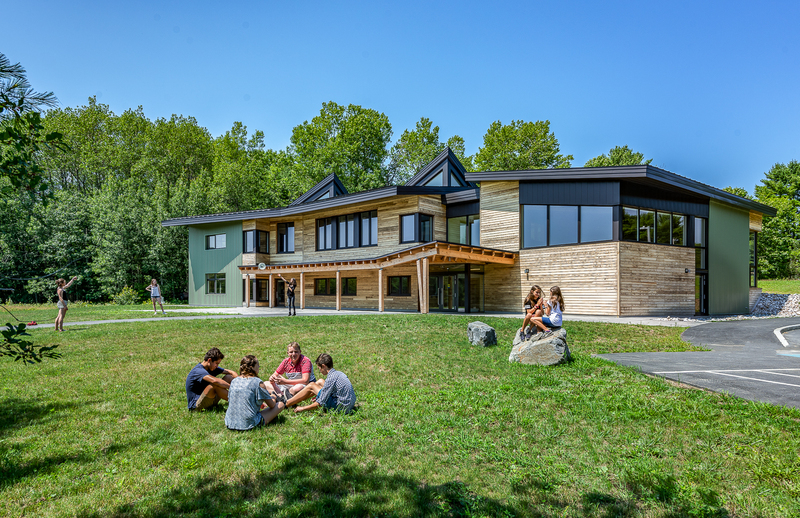 The Living Building Challenge has a credit for Beauty - in fact, it's a prerequisite. Good thinking! Maybe GBA should feature a design gallery that showcases elegant design solutions to building science issues? (Chris, get right on that, would you?) And either way, I'm curious if it's possible to find out what percentage of GBA members are trained designers, if not simply licensed architects?
" I do think that we often see fewer architects than builders chiming into this forum, because design is so subjective and doesn't elicit the collaborative problem-solving energy that building science does." Well where does one start? Or end? I think Phil, that you may have encountered the tip of something there. Like the way that one encounters the tip of an iceberg, and can't really ascertain the full scale of the thing, beneath the surface. In other words, even the farthest flung guess-imates of the scale of the issue, may be drastically under sized. Anyone here is welcome to check out a Linked In group I joined this summer, begun by a man whose material I have read now for a number of years. I came across G.K. VanPatter's online journal 'Next Design' a few years ago. It was the first time that I ever read about Rittel and Weber's work, Dilemmas in a General Theory of Planning. The new Linked In group is called the Next Design Leadership group. I think, that G.K. VanPatter may be one of the few people who has begun to get an idea about the iceberg scale of object, I referred to above. VanPatter works with some large corporations on issues to do with organisation and getting creative processes flowing through the correct channels to add non-tangible value within the company etc. His background is actually in architecture, and we have exchanged a reasonable number of comments during this few months, about education and the preparedness, or not it gives to young people for life's situations. From what I can tell so far, VanPatter and those in his community, of co-Designers and co-Creation specialists (I don't understand all the lingo on it), may have advanced quite far in defining the problem. I mean, the 'collaboration' and problem solving point that Chris made - how to optimise that more, in existing traditions such as architecture, and others. I think that VanPatter and his colleagues may have developed a solid body of knowledge and understanding about collaboration, designers, groups etc - in the same way as Wolfgang & company, would have developed an understanding of things in green building design a couple of decades ago. So my point is, that a body of knowledge does exist, and if one wanted to know more, learn more and rapidly improve along this 'collaboration' trajectory, while not stand on the shoulders of existing giants? Again, like the suggestion on Ms. Bonnie Biafore, perhaps Mr. VanPatter may do an interview so time for GBA website? Also, I read through the latest installation of PHI v. PHIUS, and I didn't wish to crowd the comment thread after that blog entry. But I will mention it very gently here again, that Ms. Victoria Stodden has done some very, very solid research into this kind of issue. I would drop a subtle hint here again, that maybe GBA website could feature an article, like a bigger overview of scientific method and digital methods some time. I linked the iSchool Berkeley podcast in the other comment thread here at Green Architects Lounge. All the best, BOH. You wrote, "Ms. Victoria Stodden has done some very, very solid research into this kind of issue," but you never told us what you meant by "this kind of issue." At first I thought you meant the PHI-PHIUS spat, but I wasn't sure what kind of category of issue that fell under -- something that Victoria Stodden might research? Earlier in your comments, you wrote, "In other words, even the farthest flung guess-imates of the scale of the issue may be drastically under sized." I'm baffled here, too. Is this the same issue or a different issue from the one Victoria Stodden is commenting on? Brian, it might be good for you to define each issue so we know what you are talking about. When I clicked the link you provided on a different page, it seems that Victoria Stodden is focused on the issue of "greater transparency in our computational science." All fine and good, I suppose, but I am still confused as to your point. That was pretty silly of me, now I will admit. I lumped together a few things, which were completely different. Okay, to clarify. The Ice Berg part of what I wrote, had to do with Phil's point about developing better awareness and skills in collaboration, amongst established professions such as architecture. It's a completely separate point to the one on research into scientific method challenges in the age of huge datasets and computational capability. I totally confused matters by linking them together in the one comment. I'm sorry about that. Someone reading it, as you rightly pointed out, would have no idea which point I was making, related to which. On the separate issue of scientific method - on the front page today - in part 3 of the PHI v PHIUS story, I read that Wolfgang was talking about keeping things open. I would like to make the connection between Wolfgang's background in the scientific method, and the tradition that goes with that. Papers are published. Things are kept out in the open - as in the language of mathematics in the past. But today, the articles that appear in scientific journals are based on computations using code put together by the scientists themselves. This creates a difficulty, and a problem as far as peer review (as in the scientific method tradition) goes. Martin, I don't come from a very scientific background myself so I will not presume to speak for that community in any capacity whatsoever. I won't confuse matters here at GBA either, by opening up this point on your comment thread on the front page where you supplied Wolfgang's statements for use to read. That matter already seems to have more than enough of voices and theories. But Martin, I would say, that if one wanted to represent Wolfgang's point of view, his tradition, where he is coming from - the research and podcasts I have linked to featuring Ms. Stodden wouldn't be a bad reference at all. I'm not saying that you have to consider the work of a researcher who is not at all directly involved in the PHI v. PHIUS debacle. But I will say this much. The research work of Ms. Stodden, has built on earlier work undertaken by Lawrence Lessig, a very pioneering legal brain in the area of computer code. Lessig and others were behind the 'creative commons' license, that you may have come across from time to time. Lessig's work and his 'creative commons' license in turn, builds on work done by the 'Free Software Foundation' and the GNU project by Richard Stallman. Again, Stallman whom people here may have heard of, was of the old scientific method tradition, and still believes fervently that computer code is based upon mathematics, and that mathematics itself should not be ring fenced by intellectual property laws etc. However, that doesn't mean that, one should not be able to innovate and earn profits from working with software. It is just that point about legal fences, privatisation of the commons and so forth. Ms. Stodden is one of the latest people to build on top of all of the above, and extend it further to ask some pertinent questions. Anyhow, the way I see the PHI project on it's own (lets leave the American branch out of it for the time being), it is an attempt at providing a standard, providing professionals with training, and providing code in some distribute-able format, without it all becoming too swamped in legal battles, company take overs and so on. Worse still, that some company might take over part of it, and it becomes part of the cloud service. That is, the code would not even reside on peoples' local system any more. These are ever present risks, in the software world. Martin, perhaps I should have explained myself using a lot more specifics above. However, I didn't wish to get into a debate and discussion, which I don't have time resources to adequately follow up and attend to fully at the moment. I hope, that some of the above is useful in some way. Let me know if there is anything else that requires further clarification, and I'll be happy to clarify as needs be. BOH.
. . . and at the risk of getting way too far into my 'sweet tooth' territory, which is talking about big gadgets, big computers and all kinds of whiz bang technological gizmo's . . . . I'll drop a couple of more links or references. I have listened through half ways of this Green Architects Lounge podcast, whilst doing the dishes right now in the kitchen, so I feel justified in going a bit further having heard you talk about the Whole Earth Catalogue. And talking about being in parts of the world which don't have a telephone yet. Yeah, great point on the apartment, versus living in a remote rural landscape and having high transportation energy footprint. We cannot probably change the lifestyle, with regards to transportation, gas boilers in colder months and so forth. But what we can do, and it is something can north America can lead the world in, is in trying to establish a good way to share scientific information and research. North America can be the nation to come up with a new paradigm for scientific method and research for the 21st century and beyond. We need to be able to share the research and the ideas, to combine them in the right fashion, in order to find the ideas and innovation that the planet will need to sustain itself. That is much more important our carpenters driving their pick up trucks. If we want our carpenters to have something else to drive, we will need to invent an update for old fashioned scientific method. That is at the centre of the green revolution in my humble opinion. Here a good one Martin. North America invented the telephone didn't it? I'm not sure. But the telephone and the new world fitted well together, given the large distances and so on. But what is north America doing to the telephone at the moment? Chris Horn, a very successful Irish software engineer, wrote a blog entry, which you might enjoy a read of. The US appears to be on the verge of a patent war over the future of the telephone – and the consumer may be the loser. Read it at this link. But bearing in mind the danger of moving way off the map, and into the un-chartered territory of obscure climate science and super computing communities (mathematical people doing very big maths), I will provide this link. It is a link (I hope it works, I tiny URL-ed it), to a comment thread at Realworldtech website, where the news of IBM pulling out of the project to build a sustained Petaflop computer system (in reality, a whole warehouse filled with a computer) was discussed. The reason I wanted to link this discussion Martin (and you are more than welcome to delete this comment, if it is too nerdy by far), is because it contains written comments by one of the mathematicians, a Robert Myers, who tries to throw a bit of logic and common sense on the issue of building super computers. It relates back to what Ms. Stodden researched into, about the very large datasets available these days - we are talking petabytes worth of information coming out of certain high end laboratories, and the impossibility of re-running the experiment, to find out if these calculations, or simulations, are meaningful or not. Even the energy budget to run the super-computers, is massive all by itself. Apparently, it is impossible to build one of those 'secret' mysterious types of supercomputers that James Bond movies often have - because the energy footprint and density of supercomputers is so large, the satellites can pick it up I think. The point is though, the companies nowadays with the largest stock market value all possess huge datasets of information on daily life, and what people 'do' on line. Those companies also possess huge computational resources. However, the simple point Robert Myers offered in the comment thread I linked to above, is that we are not advancing the technology today, which is required in order to do really accurate calculations on weather systems and so on. Mr. Myers goes into several points about the funding for such technology from government etc. I won't even bore you with it Martin. But in some way, it all relates back to what we are trying to do with energy performance in building simulation and construction techniques. I wanted to share the URL with you, and in your own time, some time, it may interest you to read some of it. At least with Wolfgang Feist's technology, it doesn't need a sustained Petaflop supercomputer, that cannot be funded, to make it work. Maybe, that is something to be thankful for at least? BOH.